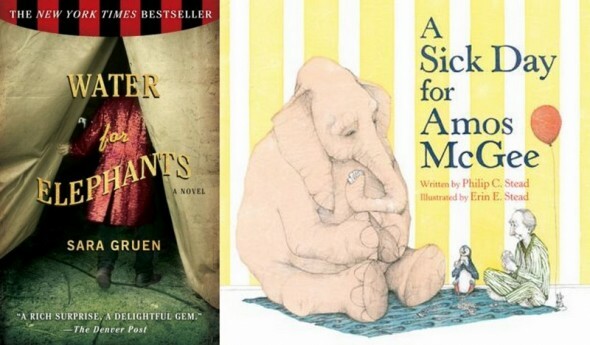 By complete coincidence, I finished the audio book of Sara Gruen’s astounding Water for Elephants the same day that my copy of Philip and Erin Stead’s A Sick Day for Amos McGee arrived in the mail. That book is hard to get your hands on these days, so it was the first chance I’d actually had to read this year’s Caldecott medalist. And something about experiencing these books on the same day made me feel so euphoric that I couldn’t escape how similar the experiences were. Gruen’s debut is the story of Jacob Jankowski, a 90-year-old (or maybe 93-year-old) veterinarian looking back on his years as a young man in the circus. He is driven to the circus by horrible circumstances in his last year of veterinary school at Cornell, and he develops an unbreakable bond with the circus animals. Especially after he sees the brutality inflicted on them by Uncle Al, the circus owner, and by August, the “equestrian director.” And most especially after Rosie the elephant joins the show. He forms a bond with August’s wife Marlena, a performer in the circus with the same love for the animals. And while caring for the vulnerable animals, for Marlena (who sometimes gets the brunt of August’s brutality), and for some of the beleaguered staff of the circus, Jacob seems to find his manhood, his integrity, his humanity. All of these events are woven in with Jacob’s life as an elderly man, in a nursing home, without the independence and dignity of his former life. The circus is coming to town, and he can’t wait to go. That stirs up memories and brings out his feistiness. And both parts of his narrative, as a young man and an old one, culminate in such a tremendous ending that I was laughing and sobbing at the same time. I loved every minute of it, and when it was over I felt a new appreciation for the fragility and beauty of all life. A hefty claim to make, but it’s true. I adored it. Charlie O’Brien, you’re the best sort. Which leads me to the other book in this post, the children’s picture book A Sick Day for Amos McGee. This is Erin Stead’s debut as an illustrator, and she won the Caldecott out of the gate. Maybe it’s just something about debuts. Anyway, this is the story of Amos McGee, a lanky zookeeper who spends his days with the animals, not just feeding and watering them but knowing them. He plays chess with the elephant, tends to the rhino’s allergies, befriends the shy penguin, and reads bedtime stories to the owl (who is afraid of the dark). But one day when Amos gets sick with a cold, it’s up to the animals (they take the city bus, with an ingeniously unphased bus driver) to Amos’s house to keep him company for a change. Erin Stead’s illustrations of her husband’s already winning book are so pitch perfect for this story. I didn’t want this one to end, either, and I kept looking at over and over again to pick up more details of its quiet charm. This little doozy of a book is filled with so much love, so much humanity and care, so much evidence of a life lived in full that I actually teared up at the end. That is a lot to achieve in 32 pages. Both of these books throw back to a time when the qualities of these protagonists were valued highest. Dedication, selflessness, loyalty, even family (because who, after all, must be Amos’s family but the animals? There’s some whole other story there about that lonely, smiling man). And each in their own way cries out a little for a return to that. Jacob’s life in the nursing home, with a voice left in him that only 1 nurse will hear. Amos’s tiny little house nestled between skyscrapers, the last holdout of a bygone neighborhood. The beauty of these books is their joy to be alive, even when life clearly is not what it used to be.